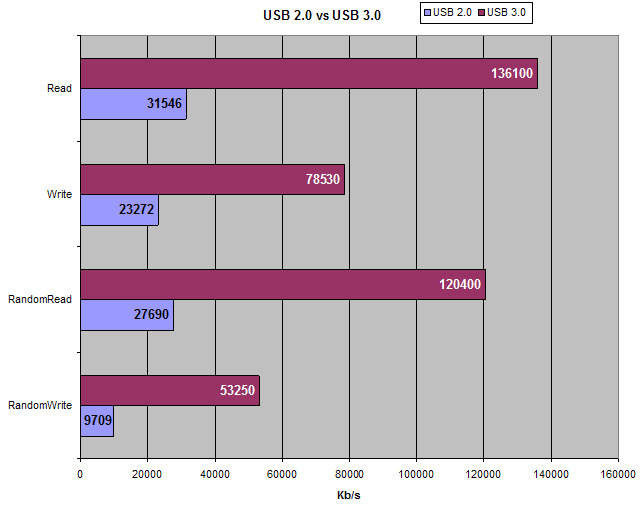 Hello again guys, hello performance lovers and welcome to this new "All in one Review", on this post I want to share with you some valuable information comparing the all new USB 3.0 standard Vs the previous generation USB 2.0 in term of performance, of course the new USB 3.0 is faster but do you have any idea how much its faster ? Lets have a small briefing, features and specifications about the new generation of USB, Then some selection of best reviewers. On September 18, 2007, Pat Gelsinger demonstrated USB 3.0 at the Intel Developer Forum. 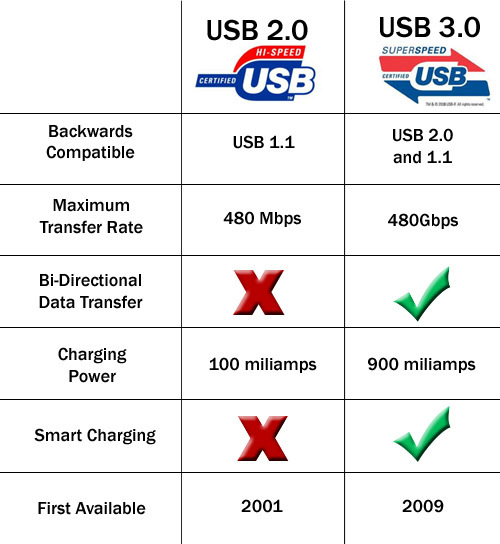 The USB 3.0 Promoter Group announced on November 17, 2008, that version 3.0 of the specification had been completed and was transitioned to the USB Implementers Forum (USB-IF), the managing body of USB specifications. This move effectively opened the spec to hardware developers for implementation in future products. The first USB 3.0 ports were featured on the Asus P6X58 motherboard; however this board was canceled before production. * A new major feature is the SuperSpeed bus, which provides a fourth transfer mode at 4.8 Gbit/s. The raw throughput is 4 Gbit/s, and the specification considers it reasonable to achieve 3.2 Gbit/s (0.4 GByte/s or 400 MByte/s) or more after protocol overhead. 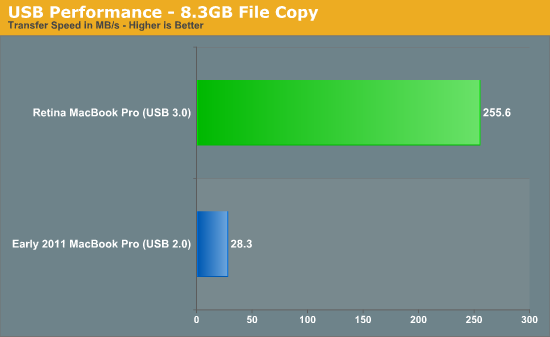 On the new Retina MacBook pro USB 3.0Vs the old 2011 MacBook pro USB2.0, performance diference is huge (by anandtech). Ottime notizie, grazie ragazzi, siete i migliori. Complimenti, continuate cosi!